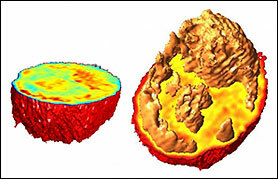 CAMBRIDGE, Mass., March 26, 2014 — A microscopy technique developed in 2007 by scientists at MIT enabled 3-D imaging of the interior of living cells without using fluorescent or other markers. Recent adaptations have taken this a step further. Now the researchers have modified the technique, enabling cells to be imaged as they flow through a microfluidic channel. This is a significant step toward enhancing cell-sorting systems that could potentially lead to separation of stem cells at varying stages of development, or even to the ability to distinguish healthy cells from cancerous ones. It also could help researchers better understand how cancerous cells grow and respond to various drug treatments. These 3-D images of living cells are based on measurements of their index of refraction. Courtesy of MIT. “Sorting of cells at different stages of differentiation … can be done with fluorescent staining, but once you stain the cells, they cannot be used,” said researcher Yongjin Sung, a former postdoc in MIT’s Laser Biomedical Research Center who is now a radiology instructor at Massachusetts General Hospital. The staining actually damages the cells, making them unsuitable for therapeutic uses, he added. “With our approach, you can utilize a vast amount of information about the 3-D distribution of the cells’ mass to sort them,” he said. Key to the new system is a focused laser beam that illuminates the cells from all angles without having to rotate a light source or the cell. This allows analysis of the scattered light as the cells flow across the beam, said Niyom Lue, a former MIT graduate student who also is one of the researchers. An off-axis digital holography technique also provides instantaneous documentation of the amplitude and phase of scattered light at each cell location. In collaboration with a lab team at Harvard Medical School, the researchers have imaged cells as they flowed continuously through a microfluidic channel. Past attempts had been unsuccessful because the cells had to be stopped at a certain point in the channel. “The only moving part in our system is the sample, which will afford great flexibility in miniaturizing the system,” Sung said. This new technique can image about 10 cells per second. However, the researchers are working to increase this to thousands of cells per second. The work was funded by the National Institutes of Health and by Hamamatsu Photonics. The research is published in PRApplied (doi: 10.1103).